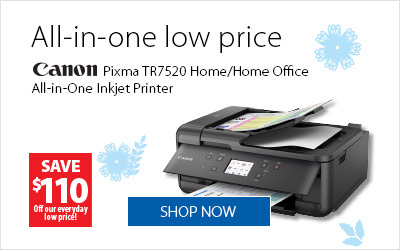 London Drugs Printers & Scanners – equip your home or workplace office with premium quality inkjet printers, laser and all-in-one printers, 3D and photo printers, scanners, ink & toners and printer paper for everyday use or special print projects. Every office needs one or more printers. If you aren’t sure if an inkjet printer or a laser printer suits your needs, you might want to consider the difference. Inkjet printers work by dropping spots of ink onto paper to create a digital image, while laser printers scan a laser beam across photoreceptors to produce digital images. Inkjet printers are ideal for printing photos and documents with lots of images, while a laser printer works best for high volumes of text with the occasional graphics. Laser printers excel at producing sharp text and handle small fonts and fine lines better than inkjets. Browse through our broad selection of inkjet printers and laser printers to find the right fit for your printing needs and budget. An all-in-one printer can perform a wide range of office tasks, including scanning, copying or faxing stacks of documents. Shop through our reliable all-in-one printers for laser-quality text and convenient wireless printing that lets you print from an iPad, smartphone or tablet. Whether you’re an amateur photographer or a professional, you’ll find a smart selection of photo printers from top brand names including Canon, Epson and Hewlett Packard. Built-in wireless models let you print office stationary and colourful calendars from your smartphone. Does your office need a scanner? Online shoppers will find affordable choices, from desk top office scanners to portable scanners that you take anywhere. Shopping for a special kind of printer paper? You’ll find everything from standard printing paper to multi-purpose and inkjet paper, glossy photo paper, printable stick-on labels, business cards and more. At London Drugs we carry hundreds of printer ink cartridges for a wide range of printers, including Canon, Hewlett Packard, Epson, Lexmark, Samsung and Brother. Stock up on printer ink and find great buys on black and colored value packs. Whether you’re looking for a new inkjet printer for your home office or a state-of-the-art photo scanner, you’ll find a wide assortment of printers & scanners in our computer department.